"My professors have been very passionate about what they do, and their passion bleeds into the classroom because they really want to share it with their students. All of this helped fuel my passion for writing and editing." 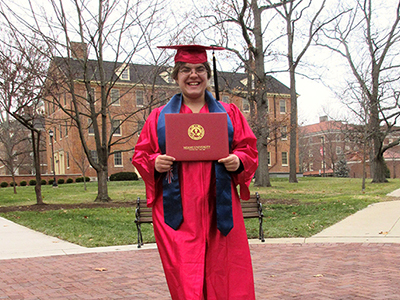 Miami graduate Marie Freeman poses on the 'Hub'. 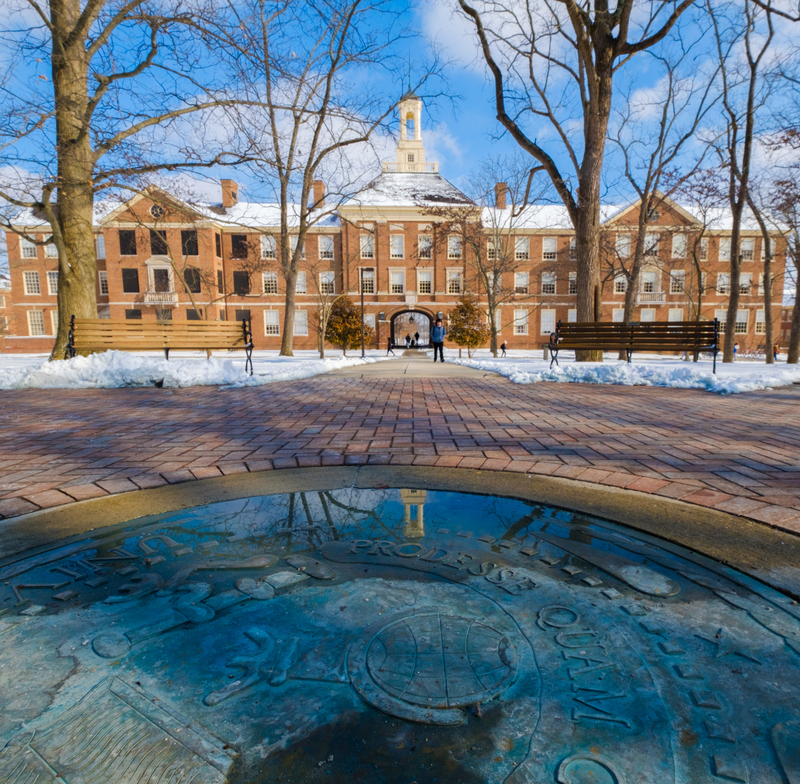 "Since graduating from Miami, I have traveled to several places in the U.S. in order to visit friends, spent time with family on the East Coast, and moved to Maryland with a former roommate. 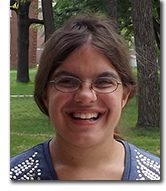 I am working part-time while I continue my search for a full-time position in the professional writing field." "I went to a Christian liberal arts college in Massachusetts my first year of college and really loved it, but it was expensive and I had to reevaluate things at the end of the year. I had a good friend from high school who came to Miami, and that prompted me to take a close look. After realizing that Miami was a better fit, I applied and have loved it here ever since! "Miami was a good transition for me. One interesting experience I had was being placed in an off-campus apartment instead of a dorm, along with other transfer students. One thing that helped was when I got involved with Campus Crusade my first semester, and soon after I also started working at Sundial Pizza in the Shriver Center and now in Armstrong." "It was my second year here when I really felt like I was getting centered. Then, during my next-to-last semester, I found out I had enough credits to graduate early. Because I'd save on my student loans, my first thought was obviously, 'Yes, I want to do that!' But when it came to my last semester in Fall 2014, I felt like I had to catch up on a lot of stuff that I'd been missing! "I really enjoy sports. The school that I came from was so small that they really didn't have a big sports culture, but I loved Miami's ice hockey events and going to football games. "I also really enjoyed my time with Campus Crusade, which is a great Christian organization on campus. It's really just more of their community aspect, and there are both full-time staff and interns. The organization is very much focused on students just coming together, with guidance from older mentors. "In the summer of 2014 I went on the Literary London trip. It was not only the best experience I had at Miami, but also one of the best experiences of my whole life. We spent 6 weeks in the heart of London, and it was a great opportunity to share that experience with other Miami students." "I liked the College of Arts and Science because I feel it gave me a very broad advantage in my education. In English literature, for example, there are so many areas that you can go into, and you're not pigeon-holed into one career after college. I was able to take a variety of courses, many of which I thought I might not have liked when I first started. They give you the freedom to learn what you want to pursue as you go along, and there have been many opportunities to learn and grow because of that. "Initially I took a number of English literature and professional writing classes, which I loved, but I decided to focus on the professional writing major because it specifically has an editing track, which is perfect for my genre fiction editing aspirations after college. I also took a print and digital editing class that helped focus me more and gave me an idea of what to expect. "I liked how my English classes were set up. They are very small, with about 20 to 25 students, which allowed much more interaction with the professor. My professors have been very passionate about what they do, and their passion bleeds into the classroom because they really want to share it with their students. All of this helped fuel my passion for writing and editing." 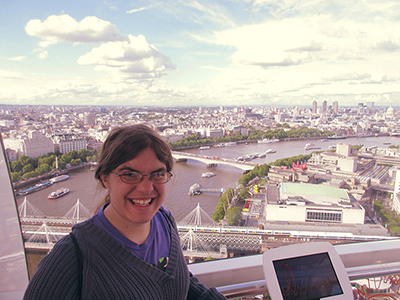 Marie Freeman overlooks London and the Thames River during her study abroad experience there. "Even before I came to college I knew that I wanted to study abroad—it was just something that was very appealing to me. I initially wanted to go to Italy during my junior year, but then I started looking at summer programs instead. I was walking through the English department in Bachelor and saw a Literary London flier that described the six-week program. The classes I'd take on the trip were directly part of my major, so I knew they would allow me to get as much as I could out of the experience. "During the trip we had three options for classes: Shakespeare (how can you go to London and not have a Shakespeare course? ), Tudor-era literature, and contemporary fiction. There was also an internship for some students at a publishing house in London. I took the first two courses twice a week, and then each Wednesday all three classes came together to have a specific cultural experience. "We were given a lot of intensive coursework, but there was also a lot of time to have fun. On Friday through Monday we were free to do whatever we wanted, so some of us travelled around Europe each weekend. I joined groups who went to Ireland one weekend and then Stonehenge, both of which were a lot of fun. It was really a whirlwind experience. "London is such a magnificent city, with so much to do, but after the first week, I felt disoriented and overwhelmed because I felt I needed to do everything! I sat down and said to myself, 'Okay, I love theater, so I'm going to go to as many shows as I can.' We were staying near the West End, which is the equivalent to Broadway, and so I went and saw Wicked, which is one of my favorite shows, Les Miserables twice, Phantom of the Opera, and more. We also saw productions of the Shakespeare plays we were reading in class, which included going to the famous Globe Theatre! "I made really lasting friendships during the trip, and because it's a shared experience you form really tight bonds. London is a different culture—even though there are a lot of similarities, you have to get assimilated and be very respectful of that culture and try to coexist and learn as much as you can. I feel I've become more aware of cultural differences and how important it is to respect them." "Don’t be terrified of exploring—that is what college is about. Obviously you are here for an education, but there are so many options and opportunities to discover that you should never feel pressured that you need to know immediately what you want to do as soon as you come in. "Also, don't be afraid to go to faculty office hours, because that's when you really get to know your professors, and they get to know you and perhaps even mentor you. This is important especially if you're in a larger class and feel like you're getting a bit lost. Professors want to get to know you. If you make an effort, they will as well."